These pens write very smooth and dark. Great for writing and inspiring anyone to cross off their to-do lists. Add a little extra color to your cubicle or desk space with this decorative pen set. 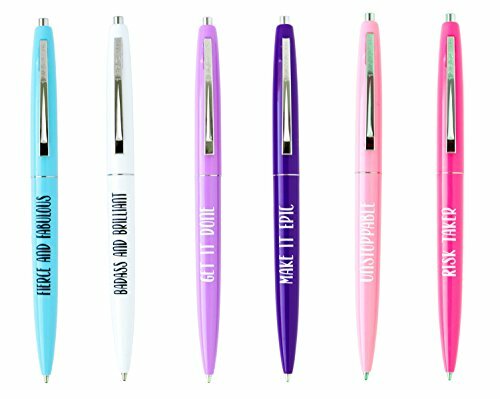 Blue pen says Fierce and Fabulous, white pen says Badass and Brilliant, light pink pen says Unstoppable, Neon Pink pen says Risk Taker, light purple pen says Get it Done, dark purple pen says Make It Epic. If you have any questions about this product by Goodey Studio, contact us by completing and submitting the form below. If you are looking for a specif part number, please include it with your message.